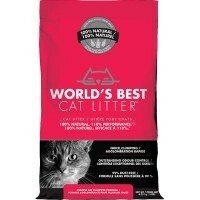 Worlds Best Cat Litter - Extra Strength is a premium cat litter, effectively eliminating the unpleasant smells commonly associated with litter trays. The extra-strength formula boasts a super clumping and liquid absorption ability and prevents the sticky mess in the bottom of the litter tray, often the case with other litters. This environmentally friendly cat litter is non-toxic and 100% biodegradable.